This is the post I’ve been dreading to write and needing to write. I haven’t written, truly written, in quite some time on this blog and that’s because the reality of my situation was not too fun to share. I’m not running. There! I said it! That can be the end of this post, right? No, it can’t. So, here’s the story. Catholic school kids love allegory. Now that’s a statement for the ages, huh? Seriously though, we grow up on Bible tales, we study metaphor. We read C.S. Lewis, J.R.R. Tolkein, Hawthorne & Poe. We are immersed in it. No big surprise that I have an allegory for running, an extended metaphor at best, but stick with me for a minute. December 2011 found me hunting humane society websites for the perfect dog. This is a problem hobby of mine, much like perusing lake shore real estate. It leads to fantastical thinking and can consume any free time I have. Dangerous. Any-who, that snowy winter month, I found a brindle-coated Chihuahua on a local humane society website and begged Phil to take me there to meet him. Phil begrudgingly agreed and we found, and adopted, Cheeko the Chihuahua. Now, we have a perfectly wonderful, well-adjusted dog at home, but I always had the feeling she was lonely and wanted a friend. Projection much? Cheeko was 9 years old, a surrender from an older man who could not take care of him. 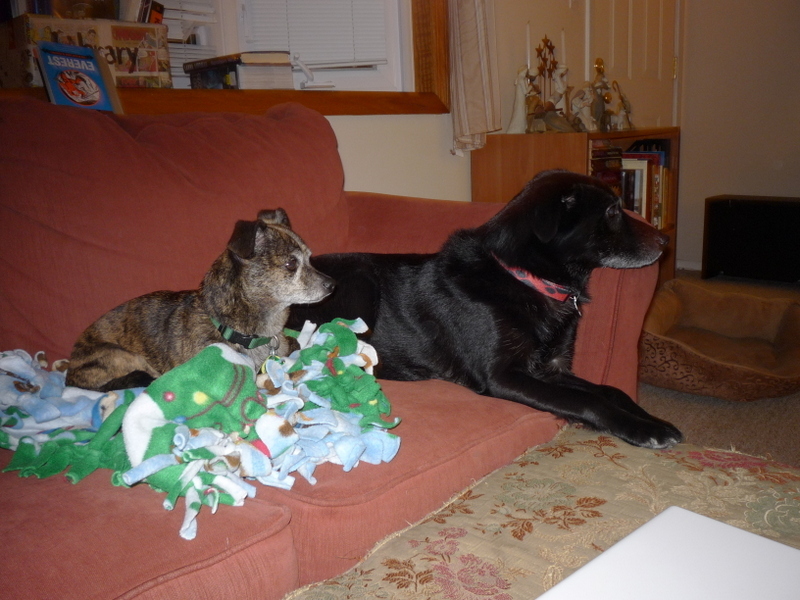 Reese, at 7, was no spring chicken, but they got along OK. Cheeko enjoyed blankets, curling up on the couch near your feet and other adorable things like biting and pooping by the back door. Oh, wait, I guess only some of those things were adorable. I loved this dog. I loved the way he looked, the way he snuggled, the way he panted. I walked him, cajoled him out of bed to go outside, rewarded him, praised him, cherished him. And the little pisser still bit me in the face. Literally. Bit. Me. In. The. Face. And, religiously, he pooped by the back door at night. 17 trips outside, 2 long walks and he waited until my back was turned and took a gigantic you-know-what by the back door. Every night. He was consistent, if nothing else. After an exhausting 7 months of trying to get him to love us, we relented and admitted that the relationship was one-sided. 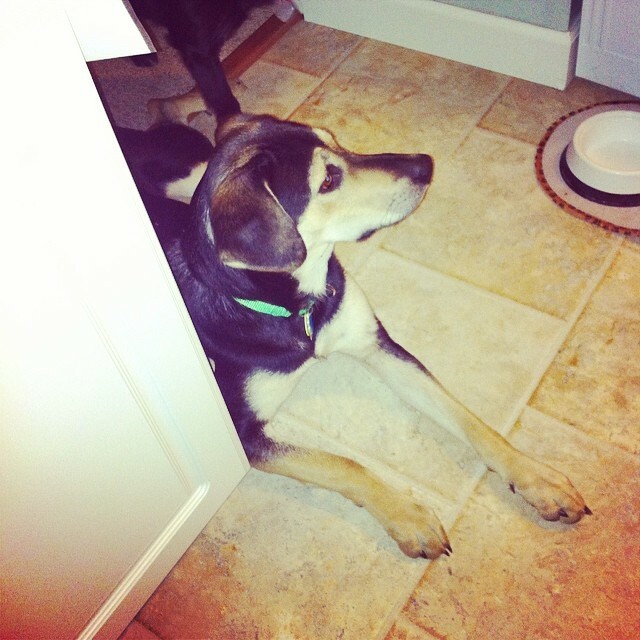 This dog needed a home with a single, loving human that could handle his cantankerous personality. I drove him back to the shelter and sobbed as I handed over the leash to the humane society employee. She comforted me, promising me that I was doing the right thing. Running is Cheeko and Cheeko is running. I have nurtured myself as a runner for the 6 years that I have been all-in with this sport. I’ve bought good shoes, cajoled myself out of bed at 4am – ON WEEKENDS – rewarded myself with good food for miles run. I’ve cross-trained, timed, recorded, studied mileage logs. I’ve studied books, magazines, websites. I’ve joined Twitter chats, found experts online. You get the picture. Yet, I am chronically injured. That’s a tough set of words to write. I didn’t come to this sport at 12 or 13 years old, with fresh legs and adolescent energy. I came to it at 27, overweight and with my body bearing the scars of two pregnancies and a lifetime of inactivity. So, some injury was to be expected. But, for now at least, this sport is biting me in the face. The problem is, I love it as much as I loved that little pisser of a Chihuahua. I love the effort this sport takes, the mental freedom it gives me, the sense of accomplishment. I love the summer nights I spent running through sunset and turning my head lamp on with the light of the moon. I love the thrill of a start line and the heartbreaking joy of the finish. But I can’t keep ignoring the fact that, at least for now, the sport is not loving me back. I’m done with physical therapy, I canceled my last visit to my sports med doc. I know that one, tiny band of pissed off tissue is my problem. I can keep doing my exercises, keep massaging it and keep cross-training, but long distance running is only going to make it worse right now. So, deep breath, I dropped out of the Rite Aid Cleveland 10K. I’m not ready for it. And walking it, even with a little running, will only make me more lonesome for racing than I am now. Why, yes! Yes, I did! A few weeks ago, we found another rescue and I’m thrilled to say that she’s the perfect fit for our family. Sweet, smart and does all of her business outside in the yard. Sleeps with her head on my should and never bites my face. Now, I could extend the allegory and tell you all about how this dog represents my yoga practice, but I’m sure you’d be ready to throw me on the crazy train if I did. I’m enjoying long walks with this wonderful dog, plenty of kettle bell training and yoga. Lots of yoga. Will I run? Yes. I have my first Olympic triathlon in August and that will take some running. Hopefully, by then, my legs and my heart will be ready for it. The question is – what do I do with a blog that was built on my running? A personal re-branding of sorts? Have you considered a blog name change? Something that better represents who you are now? I’d love to hear about it. I think it would grand for you to write about what you do for fitness that isn’t running. How do you feed a running junkie who can’t run? At any given time there are an easy half-dozen of your out there! Maybe you’re not literally RUNNING… but more figuratively running toward a goal that isn’t running? Running toward to the future? I was wondering about your plans — just as well you didn’t make the MCM lottery, because you might be miserable (or you could transfer/defer/etc.). It seems to me that being happiest with yourself is right up there, and you’re obviously really into exploring Yoga and Kettlebells that it’s hardly a bad thing. And also, imho, not unusual. I’m getting burned out on the idea of Tris. It’s always troubled me that you can affect your performance in that sport just by spending more money. A faster bike, a better wetsuit, etc. So I’m likely going to lay off this year except for an odd Sprint here and there. But I won’t, for instance, take it out of my Twitter bio, because I still plan to do them, albeit infrequently. Anyway, it’s not like you have been told you CAN’T run, it’s just that you have new interests that you’re fired-up over, and that’s a great thing. You might eventually come back to running more often, or you might not. But I suspect you’ll be flexible as you decide. So, I’d leave the blog name, because, if anything, it’s a reminder that even if you’re not running, you’re always moving forward towards SOMETHING, and it’s not like “Go Downward Facing Dog Jess” would necessarily work. 😉 😛 But seriously, don’t let the blog title define who you are. Hell, I’m still using a name from an MMORPG where I fought monsters with flaming arrows. Although I did run away from monsters a lot, so there was that. Thank you! I think not getting in to MCM was a pretty clear message. I suppose we are each our own brands – I think if I saw you in person I’d yell “Tai!” as if it were your first name. 🙂 So, no Yogi Jess for right now. I’m literally having the same problem. I want to change my Twitter handle so badly and my blog name.. but it’s hard once you have people that follow and know what to look for. However, I’d leave the name. You’re still “running” whether actually running or metaphorically. You’re always running to a new goal. Just my two cents. I have been working on a draft of something very similar for my own blog after I run this pesky little race on Sunday. I feel your pain (literally… though mine is in my upper body) and the metaphor you’ve laid out is so perfect. It’s tough to consider stepping away (at least partially) from something that you’re not sure you have a replacement for. But I’d keep the blog name the same – running is what brought you here! Thanks Jen! I hope you are feeling better. I’m lucky in the sense that I love so many cross training activities. I hope you have something to keep you busy while not running! 🙂 The latest book club book could do it! Change it. I just changed mine in December. It’s not fun to blog or Tweet or anything under a name you no longer identify with. I started to feel like a fake toward the end. Not a good feeling! It’s not the end of the world although I would say think about your next name and pick something that will grow with you. 1. I love allegories and I hope you continue. I would love to read the scout/yoga metaphor. This is beautiful. You shouldn’t apologize for really writing. Thank you Katie! I’m going to write it – even if it’s just for me! This broke my heart a little because i’ve been injured and had to make tough decisions like this.